When pallets of plastic-bound tables and chairs appeared in Shore's Library on a recent fall day, curious students were among the first to start tearing the wrapping off the bright, modern furniture to try it out. This made teacher-librarian Debora Collison smile. Along with school librarian Chris Hubbard, Collison has been one of the principal advocates at Shore for transforming the Library, originally constructed and furnished in a traditional style in the early 1990s, into a vibrant, contemporary space for collaborative learning, exploration, and serendipity. The movement to redesign old-fashioned "transactional" libraries into transformational environments that reflect modern, student-centered modes of teaching and learning has in recent years swept through schools around the world—and now, as students bounced in springy blue chairs and tested the table wheels, that wave came to Shore. Up until the 1990s and early 2000s, school libraries mostly reflected the centuries-old idea of the library as a place to check out books or to look up information in heavy reference volumes. Even in the internet era, that model scarcely changed, with banks of computers replacing some reference materials or card catalogs, but other elements of library design remaining the same. Today, as one-to-one computing programs have nearly eliminated the need for rapidly outdated printed reference books, and as classroom practices have elevated collaborative learning driven by student inquiry, libraries have evolved to keep pace. No longer whisper-quiet enclaves, 21st century libraries are engaging, open, and often noisy "information commons" which serve as a focal point for investigation and knowledge-sharing that extend and enhance work done in the classroom. In Shore's reimagined Library, bright blue chairs, comfy sofas, and blond wood tables on casters are an invitation to just this sort of experience. While Collison is quick to note that books remain a focus at Shore, she acknowledges, "We knew we needed a truly multi-functional space that we could reconfigure at a moment’s notice, so that if someone wanted to host a debate in the round, we could accommodate that, and if someone needed a breakout space or makerspace, we could achieve that as well." Now, teachers and Support Services staff can create mini-classrooms or individual workspaces for small group study, test-taking, or Extra Help and advisory periods. Students can gather in lounge-like nooks to collaborate on projects, chat, or get a head start on homework. In a new greenscreen area, classes can use iPads to record presentations, news reports, and world language skits. In another corner, math games and materials for tinkering are available for exploration. Meanwhile, in the Lower School room, children can move wheeled tables easily to read together or create their own space, even as they browse the tempting shelves of literature all around them. It was clear from the moment the new design was in place that the open, flexible, kid-friendly feel draws children in. Says Collison, "We've observed much more traffic in the Library. The taller cafe-style tables by the windows are a popular spot for older students and faculty members who want to get work done, and the sofas are wonderful gathering places for larger groups." As a bonus, she adds, the popularity of the new Library spaces has also increased circulation of books and magazines. "We wanted a hub that would serve everyone," Collison explains, "and that's what it's become in a very short time. And not only for students and teachers: the Parents Association is eager to host events and guest speakers in the Library, and a public workshop with representatives from Apple is on the calendar this fall." Everybody comes to the Library, she notes, so the staff can be facilitators to connect people, or just point them in the right direction. "We see a new level of excitement about the Library, particularly with the students," Collison says. "They feel a real ownership of the space; they’re rearranging the furniture themselves. And if they feel empowered to make this space their own, to be curious, to become independent learners, then we feel like we're true to the school's mission, and the Library's." The work is not done, however. Coming soon are an expansive new collection of e-books and companion app, Sora, which enables students to explore books on the iPad for both class-assigned and pleasure reading. Also on the way are gallery areas to showcase student art and interactive works. Looking ahead, Collison envisions lower, moveable book stacks that encourage more rearranging and browsing, and she imagines even more areas for casual gatherings, furnished with inviting sofas and armchairs. "We've seen that our students work best when they're comfortable, so we want to encourage that," she says. Will Shore's Library ever feature a coffee or juice bar like those installed by other schools as part of their own library redesigns? Probably not. But, says Collison, "The kids have said all we need now is a Dunkin Donuts in the Library, and if they feel that comfortable here, then that can only be a good thing." Upper School science teacher Julia Bateman worked at one of the cafe tables. 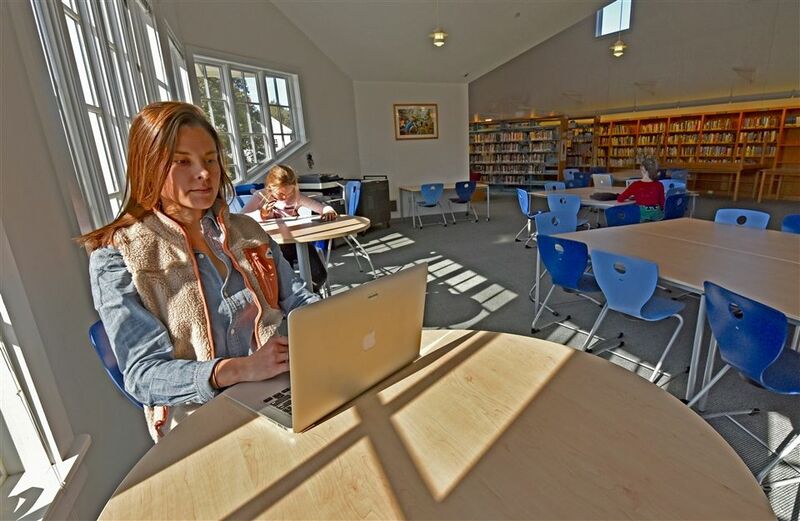 Upper Schoolers stop in often during Extra Help and study periods. Lower Schoolers got their own updated space.